Thon Maker found his groove. 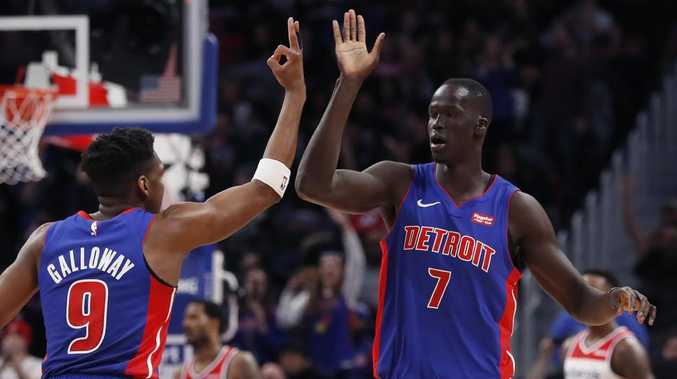 ANDRE Drummond had 32 points and 17 rebounds, and the Detroit Pistons extended their winning streak to four with a 121-112 victory over the Washington Wizards as Australian star Thon Maker made the highlights reel. Blake Griffin had 20 of his 31 points in the first half for the Pistons, who haven't lost since blowing a 25-point lead in a home defeat against the Los Angeles Clippers on February 2. Detroit began Tuesday's game tied with Miami for the last playoff spot in the Eastern Conference. The Wizards, who are without injured John Wall and Dwight Howard, traded Otto Porter Jr away last week. Nevertheless, they came into the game on a two-game winning streak before falling short against Detroit. The Pistons led by 10 in the first quarter. They were up 61-59 at half-time before pushing the lead back into double digits in the third. Detroit went on a 13-2 run and took an 81-71 advantage on a three-pointer by newly acquired centre Maker. The 21-year-old left Milwaukee this season because he wanted more game time and he made the most of his 14 minutes on the floor, chipping in with five points and four rebounds for the Pistons. But it was his soul-destroying first-quarter block on Bobby Portis at the rim that provided his biggest highlight for the match. Maker's aggressive approach came at a cost, though. According to Pistons beat writer Rod Beard, Maker required five stitches to his upper lip after his mouth was left bloodied by an earlier screen. 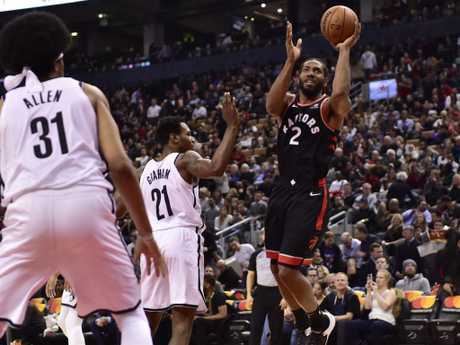 Kawhi Leonard banked home the tie-breaking basket with 4.2 seconds remaining and the Toronto Raptors edged the Brooklyn Nets 127-125. Raptors centre Marc Gasol scored 16 points, 11 in the fourth quarter, in his home debut after being acquired in last week's trade with Memphis. D'Angelo Russell scored 28 points and had a career-high 15 assists for Brooklyn. Joe Harris scored 24 points and made a career-best seven three-pointers, but the Nets lost for the fifth time in six games. Toronto led 120-114 on a three by Lowry at 2:45 of the fourth quarter but Crabbe replied with back-to-back three-pointers to tie it at 120 at 1:34. Russell hit a tie-breaking three with 50 seconds to go, but Danny Green answered with a three for the Raptors. Harris made five of six from three-point range in the first quarter and Brooklyn led 29-21 after one. The five three-pointers are the most Harris has ever made in a single quarter, and matched his season-high for an entire game. Leonard scored nine points in the second but Harris made two more from long range, giving Brooklyn a 60-56 lead at halftime. Russell scored 14 points in the third, but Ibaka had 12 for the Raptors, who tied it 92-all on Anunoby's driving basket in the final seconds of the quarter. The Cavs heaped more misery on the Knicks. 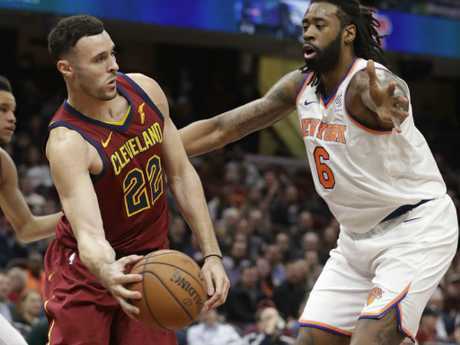 Collin Sexton scored 20 points and the Cleveland Cavaliers held off a late rally and sent the New York Knicks to their franchise-record 17th straight loss on Tuesday (AEDT). Sexton hit two free throws with 17 seconds remaining to put Cleveland up by three. John Jenkins missed a three-pointer from the right corner, but Dennis Smith Jr. grabbed the rebound and dribbled to the corner. He also missed a three-pointer and Larry Nance tapped the rebound to midcourt as time ran out. Nance and Jordan Clarkson each scored 15 points. Kevin Love had 14 points and nine rebounds in his second game since returning from foot surgery. The All-Star forward played 16 minutes, all in the first half. Love was four of 10 from the field, including two three-pointers, and had nine rebounds. The Knicks trailed 71-54 early in the third quarter. New York got within four points several times and back-to-back three-pointers by Luke Kornett cut the lead to 105-104 with 51 seconds left. Kornett missed a wide-open three-pointer with 21 seconds remaining that would have put New York on top. Sexton followed with his two free throws. Both teams are in the running for a prime spot in the draft lottery, which takes place on May 14. The three worst teams in the league will have a 14 per cent chance of getting the first pick in the draft and a shot at grabbing highly-rated Duke centre Zion Williamson. Phoenix (11-47) and Chicago (13-44) are also possibilities for a top three pick. The Cavaliers led wire-to-wire and jumped to an 8-0 lead, leading Knicks coach David Fizdale to use a timeout less than 90 seconds into the game. The Knicks, who traded injured star Kristaps Porzingis to Dallas on January 31, have their longest skid within one season. New York lost 20 in a row over two seasons in 1985.